#1 FIRST WEEK OF SCHOOL: This will not only helps you learn your students’ names, but it is extra helpful for the specialists (music, art, P.E.). The poor specialists see so many students in a day. They deserve our support by having students wear their nametag for a week instead of the typical first day of school. #2 SUBSTITUTE: The next time you are absent from school, leave nametags out for your students to wear. Your sub will thank you and your students’ day will go much smoother. Does your school use wristbands? 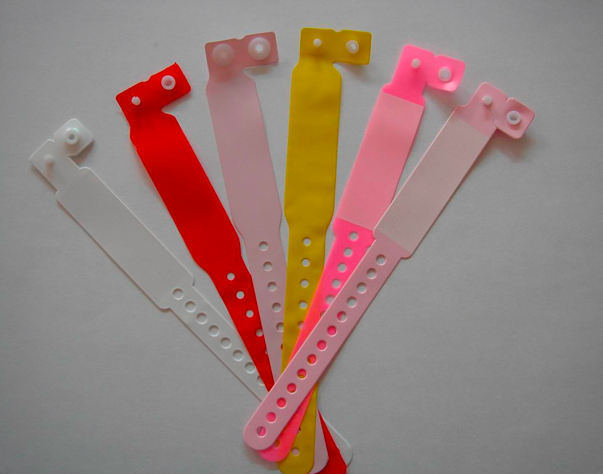 Hospital wristbands are very useful for kindergarten teachers. You can write bus #, classroom #, and other helpful information on them. There were many times during the first week of school, that I would walk a kindergarten class from point A to point B, and not end up with the same number of students that I began with. I taught kindergarten in 3 different large schools – 900-1100 students so the hallways were often crowded. There were always one or two students who saw a teacher with brown hair and jumped in her line instead of staying in my line. Granted, the hallways were narrow and full of students, but really is it so hard to walk in a line? If you are five years old and in a huge, new school, then the answer would be yes. When I would call the office to let them know I am missing a student they would send the counselors off on a search mission. When they would find my missing student, they asked him/her “what is your teacher’s name.” It never failed; they would say “Teacher”. Then they asked the student “What does your teacher look like?” They always said she has brown hair. Do you know how many teachers have brown hair in a school of this size? Thankfully, with the wristband on, students could be guided back to the correct place. The morale to this story is, if you teach small children in a large school, invest in hospital wrist bands! One of the schools I worked for was built for 600 students but we had almost twice that many students at the time. The district was in the process of building new schools to relieve the overcrowding, but we were very crowded in the meantime. At dismissal time, each kindergarten teachers lined up their class in one single line and had our students hold onto a rope. The students held onto the rope while we walked from our classroom to our dismissal spot. This helped get our students to the correct place at dismissal time when the hallways were extra crowded. « Your voice is your instrument – use it wisely! Love these tips! Great advice! I'm a new follower! We put paper luggage tags on the students' backpacks that include their name, their teacher, and how they go home on the first day. Then we change it, if their information changes for the rest of the year.